Okay, here it is, finally! I had a few hours of nearly cloudless sky and I managed to get these photographed. All A-Bordeaux The Sled. Very dark vampy brownish wine creme. This one is pretty straightforward. It's dark, it's shiny, it's vampy. Seems more brown than burgundy. Comet Loves Cupid. 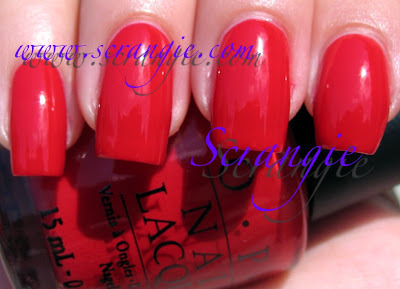 Bright holiday red creme. This is so bright and pretty! The sunlight picture makes it look a lot warmer than it really is. This is another one of those bright flashy retro-looking reds. Crimson Carol. Light crimson red with gold and opalescent microglitter. This is a light, cool-toned red base with some strong pink tones from the glitter. The glitter in this is much more dense and a lot finer than the other glitters in this collection- I'm calling it microglitter. Dear Santa. Medium red with golden glitter. 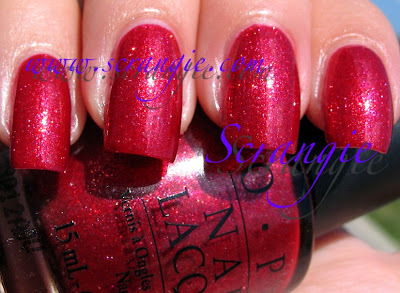 Dear Santa is a red glitter along the same lines as China Glaze Ruby Pumps. This is more golden than Ruby Pumps, but it has that same hot coals under water look from the glitter in the jelly-like red base. Gorgeous. Glove You So Much. 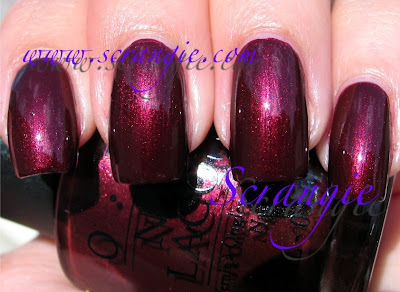 Maroon red shimmer. Another pretty wine shade! Sorry about the bubbles :( Again, the sun brings out the warm tones while the indoor picture picks up on the cool tones. This one looks velvety. Holiday Glow. Awesome. That's how I would describe this color. It's a little more complicated than that- this shade is pretty complex. It appears to be a rich brownish base with red toned pearl shimmer. It also has lots and lots of gold microglitter. The pictures don't really capture how cool this is. Totally unique. Meet And Jingle. Medium shimmery red. The shimmer in this one is especially nice- it doesn't look like much indoors, but outdoors it has a lot of sparkle to it. Not horribly memorable, but not awful either. Merry Midnight. Deep warm purple base with opalescent glitter and opal flakes. Another awesome one. Very hard to capture! This is the first time I've ever seen OPI do flakes! Perhaps some of the Asia-exclusives had some.... But I've never seen them. Good job, OPI! Were you reading my Nail Polish Wishes post when you created this? Hahahaha! Anyway, this color is totally unique and I'd call it the must-have from the collection. Sapphire In The Snow. Dark blurple. Heh, I said blurple. I think that's what I'd call this- not entirely blue and not entirely purple, like a fusion of the two. These pictures are not entirely accurate- these types of colors are nearly impossible to photograph. In real life it's darker and much less blue- more purple with red tones. Shim-Merry Chic. Bronzed golden shimmer base with opalescent glitter and opal flakes. Another flaky polish! Sweet! Very sparkly. I love the brown-gold shade. Again, totally unique, I don't have another polish that's anything like this. Smitten With Mittens. Deep red with gold glitter. This is a darker and richer shade of red than the rest of the reds, and the glitter is bigger. So gorgeous. I love red glitters. So fun to look at, aren't they? The formula on these is good. It seems thinner than the last few OPI collections. I did three coats on all of these, most only needed two but a few looked better with three (Crimson Carol, Glove You So Much, Merry Midnight). They're all mostly opaque at two, but I find that the colors have more impact at three coats. They dry fairly quickly, but this particular collection takes a little longer to dry than recent OPI collections. It seems like they've been tweaking the formula again! Overall, I love this. I guess it doesn't take much to make me happy- just throw some glitter at me and I'll love you forever. This collection has lots of glitter! Red glitter, purple with glitter, gold with glitter- and don't forget the FLAKIES! I like the delicious pumpkin shade of Ginger Bells, I like the rich velvety look of Glove You So Much, I like the playful and bright Comet Loves Cupid. The only ones I'm really indifferent about are All A-Bordeaux The Sled and Meet and Jingle because they're not really flashy enough and they don't seem totally unique. They could have used a snowy silver or white or even a rich garland green instead of one of the reds, but I'm still satisfied. I knew OPI had it in them.... Go OPI! Flakies, woohoo!!! I believe the release date for this is September 1st, but I'm not 100% sure. Sometime in September. How does Sapphire in the Snow compare to Zoya Pinta? And if I'm looking for a defintely blue dark blue like your Sapphire ITS pic looks--any suggestions? Beautiful Swatches! I can't wait for this collection! Holiday Glow get a WIN, I realllly like it. I need Merry Midnight and Holiday Glow. I must get Merry Midnight, it looks so awesome! Thank you for swatching these for us! I'm not head-over-heels for this collection I must say. Holiday glow looks pretty neat, and sapphire in the snow, but I'm not crazy about them. Holiday 2008 was much better! I *heart* OPI for these! Thanks for sharing the swatches! *swoon swoon*!!! OMG! OPI has finally turned the heat back on between these and the seudes! I must have Merry Midnight! Musthavemusthavemusthavemusthave! eeeekkk! Enough reds to sink the Titanic, but I love Merry Midnight and Holiday Glow! I may pick up a red or two as well, just 'cause. -Sapphire in the snow (only if it's burple). Thanks for the beautiful swatches. You rock! I really love Holiday Glow, Merry Midnight, and Shim-Merry Chic. I wanted to like Ginger Bells, but I'm not feeling it. I'm also pretty excited that these come out pretty soon, so I won't have to wait for what seems like forever to buy them. I have recently fallen in love with nail polish, and since that time I keep seeing more and more of my money flying away. The wait for these swatches was soooo worth it, thankyou for all your hard work. My favourite is Glove you so much, I really like deep velvety shades like that. I always seem to gravitate towards the holiday collections, I loved most of them from last year too (especially brand new skates), and hollywood blonde has been one of my favourite polishes ever. I think this is the strongest collection OPI have produced this year. I'm wondering how does Sapphire in the snow compare to Zoya Pinta and I think very, very interesting comparison would be Dear Santa/Smitten with Mittens/ChG Ruby Pumps! I think OPI really surprised me with this collection - awesome! Santa, Smitten, Sapphire and my favorite - Glove You So much... Gorgeous! Sooo excited! MUCH better than the South Beach Collection or La Collecion de Espanol or even last year's Holiday Collection. Yay! Wow - I think my "must have" list just grew by at least three, maybe four colors here...stunning! I think it's a great collection, and my 2 favs are merry midnight and holiday glow. the ginger one is so unique! love it too. Thank you Scrangie - what great swatches you've given us again, and thank you OPI for all fab colours - I love all this collection. These, along with the recent suedes will be making autumn an expensive season for me. I think OPI should give you some comission because you really do the colours justice which you don't get from the bottle pictures. Any chance of you doing a comparison on base/top coats sometime. I'm always using the same for fear of buying something that won't work, but then again I might be overlooking some really good ones. Wow, gorgeous swatches! I usually love cremes, but these glitters are amazing! Very unique. This is an awesome collection! Can't wait to get my hands on them. Your nails are gorgeous as always! These will all be mine - great swatches as usual. I love their holiday offerings! Holiday Glow and Merry Midnight! Aaahhh!!! Awesome swatches. This collection looks lovely. Especially Holiday Glow. Wow. Holiday Glow and Smitten with Mittens really got my attention! Can't wait to get my hands on these. GORGEOUS SWATCHES! 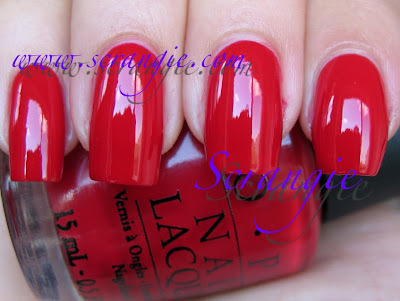 Holiday collections from OPI frustrate me in an odd way. Not because they're not gorgeous but BECAUSE they are. The holidays collections are generally pretty fabulous. Sure they've got too many reds for my taste, but there's always several shades that win my heart with their beauty of originality. But then the rest of the year they keep phoning it in with collections filled with recycled, boring and/or predictable polishes. It's frustrating! Beautiful colours! I have a question, in one of the swatches there were bubbles on the nails. I always get these bubbles. What cause them? This is the post I had been waiting on! Awesome colors; love, love, LOVE Merry Midnight. Wow i'm way more excited for these now than i was. poor wallet! Oh Wow! These look fantastic. My must haves: Holiday Glow, Merry Midnight(I want! I want!). I can't decide between the red glitters, maybe Smitten With Mittens, but Dear Santa looks fantastic too! Great swatches! Finally some shimmer & glitter. All those cremes where sending me to sleep. This is the first time in a very long time I've had any interest in an OPI collection - Glove You So Much looks so much like my all-time fave, impossible-to-find polish that I may have clawed at the screen a bit. Also loving Merry Midnight and Sapphire in the Snow! I absolutely adore Sapphire in the Snow. All the colors are gorge, cheers for posting! It's about damn time that you got some flakies OPI! What were you waiting for? I want them all but one. Maybe when I start seeing them swatched more and more I'll whittle down my list. I love glitters and hooray there's plenty. I see that you keep your nails long. I love dark colors, but I have long nails. I know people think that long dark nails look creepy. Should I just say f--- them and wear the dark colors anyway? When are they coming out? I'm dying over here! Are these out yet? Id love to sell them in my store! Thanks so much for taking the time to do your swatches. It really helps to choose colors! I'm loving this holiday set! Hello! Thanks so much for your great pics. They help me and my friends a lot in picking out the right nail colours. Our only prob is, we can't paint our nails as pefectly as you do. Is Sapphire in The Snow anything like OPI Ink? Is Orly Bon Bon any thing like China Glaze Agent Lavender? Wow! Amazing pics, amazing nails! Is Holiday Glow anything like My Private Jet? Would you have a comparison? Finally xmas colors so many to choose yeah! I love your blog. You're my go-to gal for swatches and I've been meaning to comment! From this collection, I bought: Ginger Bells and the Mini Merries (Comet Loves Cupid, All A-bordeaux the Sled, Holiday Glow, Shi-merry Chic) and I love them. I'm going to have to get Merry Midnight of course, perhaps even Sapphire in the Snow. I think this collection is excellent! I wish I could paint my nails right now, but I broke my wrist recently! On the upside, I think the splint will still come off in time for pretty Christmas colors! Sorry I wish to ask for your permission if I can put your blog link to show my customer on ebay how the OPI looks like on nails..? I am really enjoying this holiday collection, however, I think I ODed on Reds. I even got the red from the Ulta holiday colleciton. I'm no buying any more red in 2010!! I love Holiday Glow, it's so unique! I'm wearing Shim-merry Chic, and I like it which is surprised because I usually only like colors tha pop on my skintone but this is almost like a shimmery neutral for me. -I am late on the uptake (takes a while for the 2009 colours to get to Oz), however I compared "Meet & Jingle" and it is my favourite "Im not really a waitress". -Im trying to figure out what "Dear Santa" and "Smitten with Mittens" actually is, so I can buy the full size bottles. Any ideas? Are they any of the DS ones - "DS Jewel / Ruby" or "Crim-Sun"? Its been bugging me so much, I had to ask!!! please help! Late on the uptake is where many of us start to get a grasp on what was what in the shades gone by - often which are major hits still today not to mention collector items. Many of the 2009 holiday shades here are just that, collectors items. Meet & Jingle is totally different than I'm Not Really A Waitress. M&J is more in the true red family. IANRAW has a lot more burgundy in it & a tish of frost almost. Seen side by side (which you can do finding both shades on line and then doing a split screen) should show you they are very different. Dear Santa is a very bright red that has a touch of orange but you don't read it as an orange/red at all. It also has what is called glass-fleck in it, which is not a shimmer but the look that they put pieces of tiny glass in it. Really what it is, is a plastic polymer that gives off an amazing feedback of more than any shimmer/glitter in a polish formula can do. It's a highly coveted type of formula to have glass fleck and not nearly enough done in the field of polish production. I will never get tired of any shade that is glass fleck. Smitten With Mittens is now dropped in price on eBay and other secondary markets. Apparently a large amount of it was found in a # of where-houses and the secondary market is been flooded with this shade and where it used to go for $32/bottle on average, now you can find it for $14-18/bottle - still pricy but was a surprise that it dropped in price so much. Smitten With Mittens is a red glass fleck in a very dark blackened red base. The base is not one that separates out from the rest of the formula like many polishes do. This won't end up that way at all. It's just formulated to be an amazing darkened red glass fleck. It's quite different than many things and when it came out was totally unique, never seen or done before. My personal all time fav is Dear Santa and I do like Crimson Carol in the reds in this group too a lot. All can be worn other than a holiday - really everything in this most amazing collection can be worn other than through holiday season (except for maybe Ginger Bells that reads more autumn - but none the less is quite a fav of many. To me I like it a lot more than a similar shade OPI made called OPI And Apple Pie from another collection than this one. If you can afford to get your hands on Dear Santa & Smitten - you will love them and have 2 of some of the most sought after favs of collectors. None of these are part of the DS OPI collection. DS Jewel & DS Ruby are in the Designer Series line. Both are early releases in the DS line but you can find them on the 2nd market - both are retired. Both are highly loaded with what the original DS line had, diamond dust (the newer DS polishes don't have this and are more like either high shimmers or just glitters). You can pull up good swatches of these shades on a on line search. Look for Scrangie's review of these shades. She has really good photos of them. Both shades are running around $15-$32 depending on the deal you land on line. Crim-Sun is a lovely mix of orange, red and some yellow even in a pretty shade that is a bit sheer but buildable. Crim-Sun is from a highly coveted by collectors. It's from the OPI collection called It's Summer For Shore released in 2008. You can find it on the secondary market but both Crim-Sun and Sanderella are very expensive. You might get lucky on a $20 price tag for Crim-Sun - but Sanderella is up to the $60 and on up range now usually - that's just how collectable this collection is today. As you know that does not happen to most collection - most come and go. It's rare you hit 3 groups as you have mentioned here - Holiday Wishes, Early DS collections that Jewel and Ruby are both from and last It's Summer For Shore collection. Hope you find this late response to your questions. OPI has never done a holiday collection like this one before or since. I so want to see them get back to true holiday collections vs. the movie tie in's as they have with Burlesque and Muppets. I looked forward all year for OPI's holiday collections - even the years I bought nothing in polish...I would look for the holiday collection. I keep wondering if they think it's more politically correct NOT to have a holiday collection anymore?